Road construction teams began the clearing and grubbing work on the right-of-way for the new Shelter Cove road, which will connect Ketchikan’s road system to the U.S. Forest Service road system around George and Carroll inlets. The two photos show the right-of-way from the ground view and an aerial view from different sections of the 7-mile project. It’s not often a new road is built in Southeast Alaska. It took a considerable amount of time and effort by former Representative Johansen and myself as Co-Chairman of Senate Finance to acquire the funding. Two separate bills (2008 and 2012) authorizing $29 million in state bonds had to be passed by the legislature and then approved by the voters. My office has also spent many hours encouraging state agencies to make the project a priority and get it designed and out to bid. 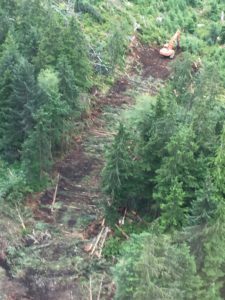 This is an exciting project that will allow access to our lands and waters for economic, recreational, and subsistence opportunities. For more information, including maps, click here. The communities in Southeast have always worked together for decades to gain energy independence and to secure a strong economy for future generations. I am very happy to see this work ethic continue with construction on the Swan Lake Dam Expansion Project. 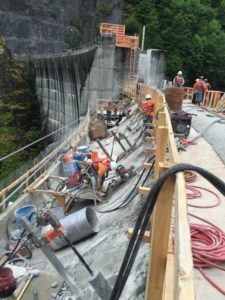 Swan Lake Dam is part of the Southeast Alaska Power Agency that sells wholesale-generated energy to its member communities of Ketchikan, Petersburg, and Wrangell. When this expansion project is completed this fall, the project will add 25% more storage capacity in the reservoir behind the dam. This increased storage capacity will save up to 800,000 gallons of diesel fuel per year. 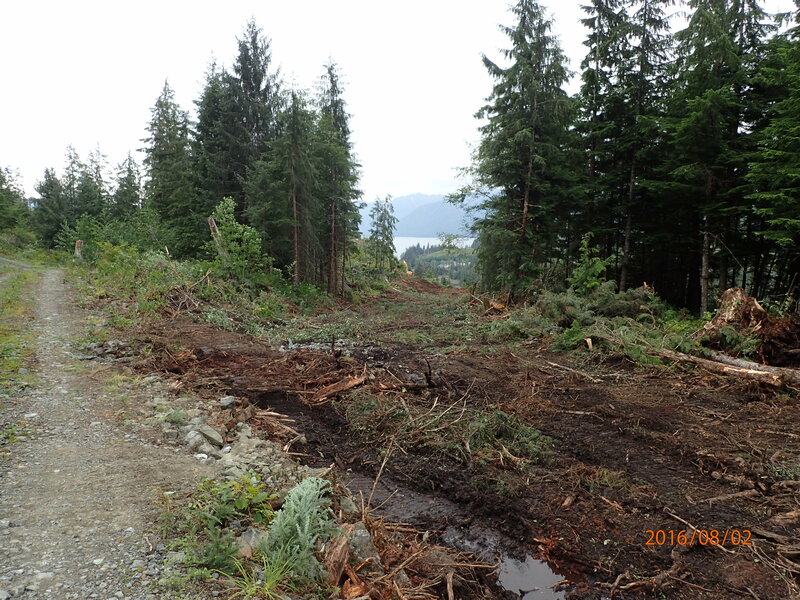 The project was the #1 priority of the City of Ketchikan, Ketchikan Gateway Borough, and City of Saxman. The funding for this project was a mix of bonds and a legislative appropriation of $3.3 million that I secured and supported through the legislature in 2014. New construction on Swan Lake Dam. On July 23rd, Lureen and I were able to attend the Sitka Tribe of Alaska (STA) annual community picnic at the Baranof Playground. The turnout was great despite the rain showers Sitka was having. 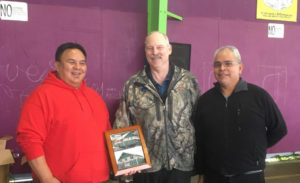 While we were there, the Alaska Native Brotherhood Camp 1 President Wilbur Brown and STA Chairman Michael Baines presented me with a photo of the Alaska Native Brotherhood Founders Hall (ANB Camp 1). The photos were a before and after of the renovations needed to prepare for the 100 year anniversary. While Co-Chair of the Senate Finance Committee, I secured funding for the restorations of several of these community halls throughout Southeast Alaska over several phases. These buildings are very valuable to the culture of our communities as organizations use the buildings for many different events.